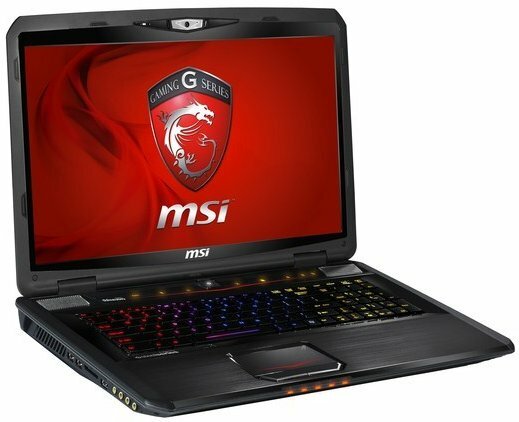 MSI has received high marks from all quarters for its high-end gaming laptops, including being selected for Innovations Honorees at the CES 2012 and being named as the only winner of three awards at Computex 2012. Now, MSI is introducing the GT70 and GT60—the ultimate in next-generation gaming notebooks. They feature Intel's third gen quad core processor and new generation Nvidia GeForce GTX 680M discrete graphics card—the fastest one of its kind on the planet. Specially designed to meet the extreme demands of extreme gamers around the world. These killer notebooks also boast awesome peripherals. Twice the performance, twice the fun! Nvidia GeForce GTX 680M--the most powerful discrete graphics card ever: MSI new gen GT70 and GT60 gaming notebooks feature the Nvidia GeForce GTX 680M, the most advanced discrete graphics card in history with 1,344 CUDAs (Compute Unified Device Architecture)--three times the number in the last generation's top performing machines. They also come with up to 4GB GDDR5 of display memory for the ultimate in display performance. And it racked up a record P24,000 on 3D Mark Vantage. What's more, it supports DirectX 11 and Nvidia PhysX, so everything from explosions and battlefield destruction to rippling water and wispy sci fi space scenes are depicted in exquisite detail. It has more than enough to handle this year's latest online 3D games. Optimus offers both superior display performance and lots of battery time: The Nvidia GeForce GTX 680M discrete graphics card offers the most advanced hardware ever and, aided by MSI's own display technology, it offers you unprecedented high definition 3D graphics. The Optimus display technology automatically performs systems switching for vivid pictures, detailed 3D graphics, smooth flowing animation, and crisply detailed images from space. When not handling high load computations, MSI's Loading Balance technology works with Optimus to switch to the power saving mode, so that the MSI GT70 and GT60 can run on battery power for nearly four hours when surfing the Internet--about twice as long as comparable notebooks on the market, giving it the longest battery time of any gaming laptop in the world. *Actual battery times will vary depending on settings and how the computer is used. TDE technology: The powerful MSI GT70 and GT60 use MSI's Turbo Drive Engine (TDE) technology, so just one touch of the luminescent TDE hotkey located above the keyboard instantly revs up performance. The GT70 and GT60 also have MSI's own powerful Cooler Boost technology; so again, just one touch of the luminescent hotkey above the keyboard kicks in the powerful cooling function to rapidly reduce system temp to enhance system stability. Intel 3rd generation Core i7 quad core processor: The GT70 and GT60, MSI's new generation gaming notebooks, feature the Intel third generation Core i7 quad core processor. This cutting-edge processing platform employs 22nm production technology, currently the most advanced on the planet, enhancing processing performance by as much as 15% over the previous generation, while saving power and optimizing cooling capabilities. To kick up performance a few more notches, the new generation Intel Core i7 processor supports Intel Turbo Boost 2.0, a technology which automatically allocates processor resources in accordance with processor load, thereby enhancing the core speed of each core to maximize computer performance. Super RAID design and up to 32GB of memory: MSI's GT70 and GT60 come equipped with four DDR3 memory slots for up to 32GB of memory. They also feature MSI's own Super RAID technology with 256G dual SSD optional. Using accelerated dual solid state drive (SSD) architecture not only gives this machine twice the storage capacity, it also cranks up read speed by some 540% over traditional HDD Raid 0 to as high as 1000MB/s, with write speeds increasing to 800MB/s. In addition to booting up more quickly, it more than satisfies the demand for faster reading capabilities required for the battle scenes and awesome effects of the latest games out there, giving you an edge in the thick of combat. The awesome write speeds increase work performance for individuals that work with graphics, such as designers and film editors, making work much easier. Unparalleled professional-grade SteelSeries keyboard: MSI has heard your calls for equipment designed with the gamer in mind. As such, we got together with SteelSeries, the leader in gaming peripherals, to create a new generation keyboard for the MSI GT70 and GT60. And they can lets you choose from among five keyboard backlighting scenarios—Normal, Gaming, Wave, Breathing, and Dual Color, that can be used in coordination with variable section lighting, and seven colors offering over 1,000 variations. Gamers will also appreciate the fact that when you depress the Gaming Mode hotkey, the frequently used W, A, S, D, and Ctrl keys located on the left side of the keyboard are all backlit in LED while the rest of the keyboard stays dark. This allows you to quickly find the key you're looking for, so you can remain focused on the rapidly changing melee you are in, giving you that extra edge you need to come out on top. Killer E2200 Game Networking: Nothing is worse than losing to opponents in online games, because of slow transmission speeds. The record-breaking, new generation MSI GT70 and GT60 gaming laptops come equipped with Killer E2200 Game Networking to give you blazing online transmission speeds that are faster than regular LAN, reducing latency/ping time for a hiccup-free online gaming experience and effectively eliminating incorrect commands resulting from game lag, greatly increasing your chances of coming out on top online. Latest USB3.0 ports: The GT70 and GT60 come with USB3.0 which boasts transfer speeds of 4.8Gbps—10 times faster than USB2.0, so a 25Gb HD film transfers in just 70 seconds. It also provides 80% more power for vastly faster charging speeds for external hard drives, flash drives, and other handheld electronic devices. MSI Audio Boost solution: To give you unequaled surround stereo sound, the GT70 and GT60 gaming laptops employs MSI Audio Boost solution technology to bring next-generation Dynaudio sound technology to an even higher level of perfection. The audio output employs a gold flash audio jack, which although expensive, is the best conductor there is. It also prevents oxidation, enhances transmission efficiency, and reduces noise, endowing the GT70 and GT60 with crisp, clear, high fidelity stereo sound. In addition, the built-in earphone AMP even gives headsets superior acoustics, so you experience stereo sound to give you a sense of space and directions when playing and no lag when listening to game sounds or when talking with teammates. It doesn't get any better than this. Dynaudio for unbeatable sound quality: MSI worked in close collaboration with specialists at Denmark's world-renowned sound system designing firm Dynaudio to further enhance Dynaudio sound technology. Vast amounts of study and countless calculations went into determining ideal speaker locations to obtain obstruction-free sound transmission. Cool metal brush finish: The aluminum chassis of MSI's meticulously designed new generation gaming laptops feature a brush finish which serves to connect each detail in the overall design, underscoring the envelope-pushing technology and style of these professional-grade machines. The GT70 and GT60 sport anti-glare full HD screens which are 17.3-inch and 15.6-inch in size, respectively, for the best possible visuals. The 720p, 30 fps HD webcam gives you smooth video and impeccable resolution when conferencing with friends and family.